Sometimes you just really want to get home. And you can’t — for the life of you — figure out how to get there. I was driving, and the girls were in the backseat. Someone had to go to the bathroom, and someone thrust an arm (accidentally on purpose) over the invisible line drawn in the air. Someone was breathing someone’s air. And that beating sun made my face hot. I stopped at the sign just east of my house, right before the gravel road that takes us home. From that spot on the highway, you can see these waving trees rising up to ring our yard. A mere two-hundred seconds away. I could almost feel the coolness of the kitchen’s rustic-maple planks under my bare feet. And I could almost tolerate the bickering behind me, in that never-ending argument of who-touched-who first. Just then, a leather-faced man in an orange vest, holding a sign on a stick, approached my car. I opened the window. “Even if I gun it?” I was only half-joking. I really just wanted to get home. Our family had traveled more than 2,000 miles in less than three weeks, and the girls and I were gone yet again, while our favorite farmer stayed home to tend to the pigs. We seriously hadn’t even unpacked the suitcases between trips. Home had never looked more inviting than it did right then. And life? Well, it really never goes according to plans. Life is pockmarked with trenches and reroutes and detours and circuitous twists and almost-empty tanks — each appearing at the worst possible moments. Sometimes, the yuckiest parts happen when the best answers to our most heartfelt prayers seem just.within.reach. But on the really bad days? Life feels like Road Closed. Life feels like one big, fat back-track. And the Good Lord knows we’ve had a few backtracks in life these last weeks. I won’t get into all of that here, but it’s been a bumpy road. That day, I thanked the road-construction worker, and I tried hard to mean it. Then, I turned the car around and headed back east, to find another road north, until I could circle around and find my way home in the west. I took the long way home that day, taking a road I rarely travel, because it was the only way to get there. I could have missed what came next. Could have missed the beauty. Could have missed the horses with their twitching tails, the Queen Anne’s lace decorating the ditches, that long lane on a farm place I rarely see. Could have missed that beautiful old cemetery, with the crooked tombstones, and a girl’s voice in the back, remembering how her Grandpa lived in Heaven now. Could have missed the favorite song on the radio that played just as we made our final turn toward home. I could have missed the miracle on the long way home. I can be such a prisoner of my own plans. And until my own plans get rearranged, I forget that God’s got some pretty remarkable plans of His own. The real journey has always happened in my detours. And the truth is, life has rarely gone according to plan. Actual life steps in and doesn’t obey what we tell it to do. And behold: Each twist in the road fills out another piece in the bigger God-Map of a life story. Sometimes we have to wait a good long while before we see exactly how. But I’ve got to believe it’s true. “I know the plans I have for you.” That’s what the Lord said long ago. It’s the bold-faced truth in 2013, just as it was in ancient days. We were nearly home, cresting the hill on a road we hardly ever travel, when one of the girls piped up from the back seat. And the gravel dusted up behind us — dusted up on some simple little back-road where the Queen Anne’s lace blooms. And sure enough, we finally made it home. “I could have missed the miracle on the long way home.” Life happens in the journey, doesn’t it? Thank you for the kind reminder today. I’ve been thinking for awhile that the living in the journey of an answered prayer – that’s where the big stuff happens. That’s where faith grows. I like how you say “Each twist in the road fills out another piece in the bigger story. Sometimes we have to wait a good long while before we see how.” I don’t like detours. There’s been a lot of Murphy’s Law popping up lately – and it wears me down – but then that’s where He can lift me up. This finding of the gifts, the blessings – it changes everything, doesn’t it! I had a roommate once, who told ‘you-can’t-get-there-from-here’ stories. I loved them then. I love them now. Thank you for telling this one so well. I needed this today. Thank you, Jennifer. This really is so beautiful. (And true) How many times will I have to be reminded that my way, my plans, my intentions are not always where the real beauty is? This speaks to me right now. Love you so. I am praying for you. 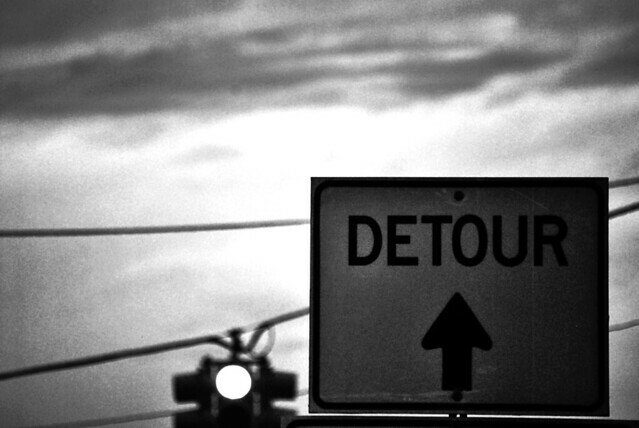 The real journey happens in the detours… oh, so true. So hard. God just doesn’t script the scenes like we do, does He? Love this post. Needed this beautiful reminder today…thanks! Oh, I can so relate to this, Jennifer. Those detours are such bummers when they start, but yes, that’s often where some really good stuff happens. Glad you finally made it home and enjoyed the miracles along the back way. Perfect for this gal today! Glad I came by on my own detour to elsewhere! You have encouraged my heart this morning, Lisa. Ah the gift of looking for beauty in the midst of the waiting…. 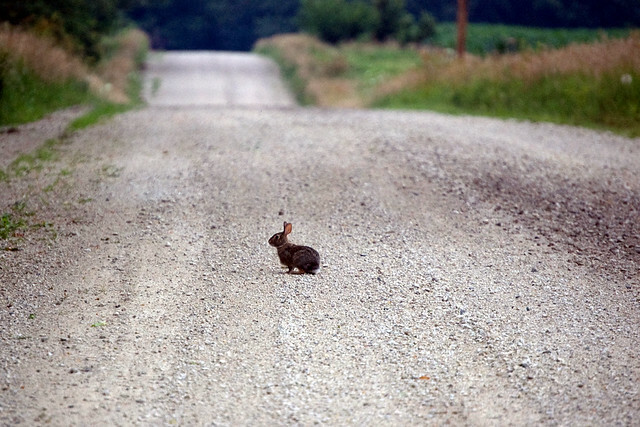 in the middle of a detour… on the journey of the long way home! This is such a great reminder of the gift of seeing things from a different perspective… of being open to see and search for and call out that which He points out to us along the way! I love this! “prisoner of my own plans” – that is SO me…all the time. Praying for grace to get beyond the confines of my plans. Beautiful, Jennifer…truly lovely and something I needed to read today. thank you. I love the way you see life-lessons in everyday events. Today, God spoke to me through your statement: “The real journey happens in the detours.” Oh, yes. That’s when we have to watch the road closely; and look carefully for the signs that will guide our way. That’s when we get to practice perseverance, patience, and trust. It wasn’t long ago I was facing a long-term detour, and as I read your post, I was remembering all the lessons I learned during that time. 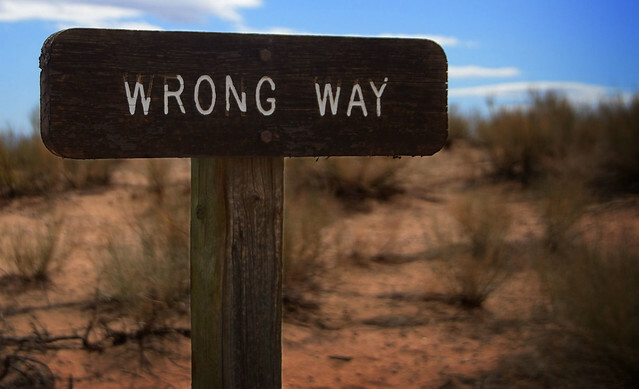 God brought me through to the “End of Detour,” and now I’m in a different, better place–praise God! You make being lost and detoured beautiful. I certainly have been detoured plenty of times and hope I see the beauty next time it happens. The detours in my life have been the most unexpected blessings 🙂 God little surprises that at first may seem to be an inconvenience turn into blessings in disguise. “The Real Journey happens in the Detours.” Yes, and thank you Father, for a lost sense of direction(the way I always seem to get lost), so I could find Your Blessings! Great Blog, Jennifer. Jennifer this is such a beautiful lesson in life. I’ve had more detours than I can count, some were as successful as yours, others not so much. But, most every one has brought a lesson and blessing from Father either during the rerouting or afterward upon reflection. I’m grateful for them all! Jennifer, I truly love how you tell a story. You had me captured and you always happen to share something I need to hear. You are a blessing my friend. “The real journey has always happened in my detours.” You and me both, sister… and yet I still fight to get my way with a vengeance… Thanks for the reminder. Love that God took you on a drive to discover your home. Beautiful. Beautiful blog! God bless you! This quote by Marcel Proust is one of my favorites: “The real voyage of discovery consists not in seeking new landscapes but in having new eyes.” True, you weren’t seeking a new landscape that day–just a quick route home. And yet, when God took you the long way around, He gave you new eyes–eyes to see glory and wonder. 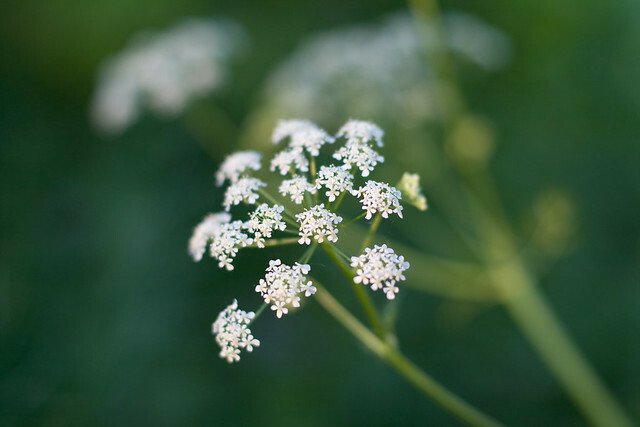 Like you, I love Queen Anne’s lace, which I see on the dirt roads surrounding our cabin. Their frothy blossoms remind me of miniature constellations dropped from the skies hinting at heaven. I love that God took you the long way home, Jennifer, because He gave you new eyes and more beauty to see along the way. And it sounds like the long way curtailed that little backseat squabble. There was enough wonder to go around to distract those boundary-line artists from their discussion (ahem!) I *love* the way you described that sisterly situation. You often make me laugh. Beautiful post, Jennifer! I am desperately looking for the beauty all around me in this season of waiting. I don’t want to miss what God has planned for me, but right now I feel like I’m on the longest detour of my life. Until I get where I am supposed to be on this journey, I will keep traveling the long and winding road. Thanks for this today. So I reckon that means today is laundry day, aye? As always, thanks for the TruthinStory. Ugh! That had to just kill you to be so close and have to detour. I think we’re traveling from Fredericksburg to Kerrville–a distance of 22 miles–via Montana. Life is what happens while you’re making plans! Thankfully, His plans for us are always best! Thanks for hosting & God bless. A detour in life. What a great reminder that this was to me as our family is now navigating around a broken engagement. One of the things in life that you know is really for the best but dealing with the loss of relationship and grief that comes with knowing that your kid is hurting. Thanks for the sweet reminders!